Tzelalot is a movement of Word Sound and Power, having the explicit intent to communicate the mystical meditation about the Shadow of His Imperial Majesty Haile Selassie I, that is the meaning of this Ge’ez word. In Ge'ez, the ancient churchical language of Ethiopia, Tzelalot means "Shadow". Shadow is the ultimate shining blackness, generated by the presence of Light. As the Psalm 90 says, giving us freedom from carnal fear: "He that dwelleth in the secret place of the Most High shall abide under the Shadow of the Almighty". Tzelalot has been founded by Matyas Tekle Selassie upon the solid Rock of the truly Ethiopian, Amharic speaking orthodox and Rastafarian tradition. Its crew is mainly composed by Bro. Kalad, Bro. Yosief and Etan-e Negus, but many more good brethrens and sistrens coopereng with I&I, through I&I spirit of love and ovastanding. Inspiration comes from Livitycal Powers. Big respect Midnite Band for their crucial examples and inspiration. 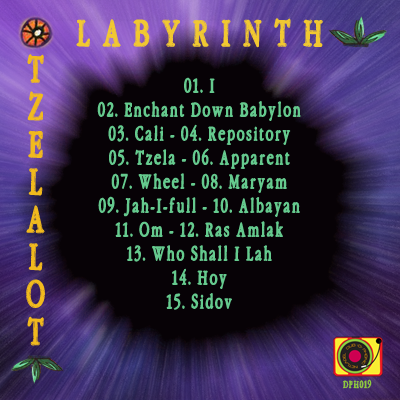 The fifteen tracks of “Labyrinth” compile only a small image of the works of Tzelalot, putting the best vibes together and showcasing the bright spiritual aura that emerges out of every track. As extra bonus we included two brand new tracks of Tzelalot, “I” and “Ras Amlak”. From the consciousness of the “Wheel” (sung in Amharic and English) and the uplifting vibes of “Cali” to the Nyabinghi influenced chanting on “Jah-I-full”, Tzelalot leads you to an esoteric journey of meditation away from the Babylonian labyrinth of today’s society.